Why is it so difficult to archive peace in the Middle-East? Is it because of people like Ahmadinejad, the Muslim brotherhood and other radical groups? They all have one thing in common, they hate Israel. They would like nothing more than to see Israel wiped off the map. 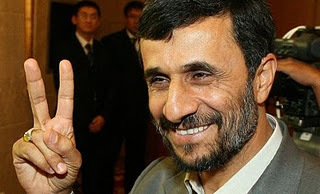 Israel is a constant target and is surrounded by enemies that think just like Ahmadinejad. They have another thing in common, they opposition to recognize Israel as a sovereign State. So much for a peaceful Islamic religion. There is nothing peaceful about Islam, especially the radical side of Islam. The Koran is not a book of peace as many claim. I heard someone say on a news show once: ” if a Muslim studies the Qur’an, and it’s teachings, they will end up being radicals. Muhammad was a wild man, conquering by killing with the sword. Many people look at the world today from a human perspective or the human level. There is also a divine perspective i.e. a divine level. Most of society thinks that all these conditions in the Middle East are man-made and resolvable with negotiations. These so-called negotiations have been going on as long as I can remember. Israel has made many concessions over the years and in return saw more violence. Society thinks that one day we can have worldwide peace. We just need to make some changes, co-exist and have more tolerance. Unfortunately, the people who want more tolerance are the most intolerant people. What the fail to see is that there are spiritual battles raging all around us, unseen with human natural eyes. There are Satanic forces that control certain areas in the world. Iran, formerly Persia is one of them. In the book of Daniel, God gives us some indication’s that there are in deed spiritual battles between the angels of heaven and the fallen demonic angels that once rebelled against God. Daniel prayed for help and guidance to understand the 70 weeks in the book of Jeremiah. He prayed for 3 weeks until Gabriel one of the Archangels finally came to him. Gabriel told Daniel that he was held up because of the prince of Persia, who opposed him. The prince of Persia was not the physical human prince that was ruling Persia at that time. The prince of Persia was a demonic force over Persia. Gabriel went on to say that he had to go because the prince of Greece was coming. There is battle going on unseen to with the naked eye. A battle of good versus evil. Does evil exist? I think we all know that there are evil people in the world. Ahmadinejad and Assad among them. They are controlled by Satan and his demonic army. Israel is about the size of New Jersey, but it is in the news just about every day. What is it about this small country that is so much in the news? There is much more to it than people not getting along. This is nothing more than a spiritual battle. Satan knows his time is running out. His time is short. He has tried throughout history to destroy the Jewish people. Haman, Herod, and many others including Hitler, were controlled by Satan and his forces. Just as he tried a to wipe out the Jews many times in the past, so is he coming after the church, the bride of Christ. He wants nothing more than for us the believers to fail. He has tried to wipe out the church right from the beginning. The early church went through heavy persecutions under Nero. Instead off wiping out the church, it grew in numbers. Satan failed in his attempts to wipe out the church. Then he penetrated the church, infiltrating it from the inside. For many centuries people were in the dark, kept from reading the word of God. This changed at the time of the reformation. Brave people like John Wycliffe, Tyndale, Luther and many others brought the Bible back into the people’s hand. Finally they could read and study the Bible in their own language. The word of God is powerful and Satan has tried for a long time to keep people from reading it. “So then faith comes by hearing, and hearing by the word of God.” Rom 10:17. If he can keep people from reading and studying the word of God, he would be victorious. He already succeeded removing the Bible from schools and government and from many people’s homes. His tactics are always the same, lying and deceiving. It worked in the past and it works today. He hates the word of God, why? “For the word of God is living and powerful, and sharper than any two-edged sword, piercing even to the division of soul and spirit, and of joints and marrow, and is a discerner of the thoughts and intents of the heart.” Heb 4:12. If you read the newspapers watch the news and see all the stuff that is going on around the world today, Egypt, Syria and many other places around the world, think off it as a spiritual battle. We are right in the midst of the battle. Let us as believers not look at the world with human natural eyes but with spiritual once. The world is spiritually blind and cannot see. “But the natural man does not receive the things of the Spirit of God, for they are foolishness to him; nor can he know them, because they are spiritually discerned.” 2Cr 2:14. God has given us His Spirit of wisdom. We can see and understand things for what they really are: a battle of biblical and heavenly proportions. In these last days, we need to be ready and put on the whole armor of God. Satan and his minions are working around the clock. Thank You, very very much. You have no idea how much this information has helped me. Now I know what the real problem is and what I should be praying about, not what the News media says the problem is. Much love & God bless. This was very informative, Freddy. I learned a lot that I didn’t know. Thank you. great post, freddy! and SO true. when that disney movie prince of persia came out, my mind went automatically to daniel. i bet they have never heard of him, but, still, it was creepy!! Amen. Thank you, I value your encouragement on this post. There are some that will not like it. Got some negative response on my other social sites like Google+. I felt like writing about this because as you stated many Christians have no clue about prophecy and eschatology. Many blessings to you. This is so true. You hit it right on. There are so many who don’t really understand what is really on. I read a lot of Biblical prophecy; the secular world and even many Christians don’t have a clue what all God has spoken about. Good post.